Patrick Horgan was the scoring star for the Rebels tonight as he shot 0-14. Clare's Cian Dillon and Cork's Luke O'Farrell in opposition. THEY WERE FLAT last Saturday in Páirc Uí Rinn but Cork responded in style at the same venue last night as they claimed an impressive win for their first points in Division 1A of the Allianz hurling league. Cork bounced back from that desperately disappointing loss to Kilkenny on the opening night as they showed a clinical edge in the second-half to despatch Clare. Patrick Horgan pointed the way as he weighed in with a massive total of 0-14 while Luke O’Farrell rocketed home a terrific first-half goal. Defeat is a setback for Clare after last Sunday’s reversal and places them on the backfoot as they try to preserve their Division 1A status. They were highly competitive in the opening period and only trailed 1-12 to 0-12 at the break but Cork took over to boss the second half exchanges. Clare had started brightly and were good value for their 0-9 to 0-6 lead after 23 minutes. Colin Ryan, Colm Galvin and John Conlon all contributed excellent points. Cork’s challenge was then revived when O’Farrell fired home a superb goal at the second attempt after his initial shot was blocked. Cork took the impetus from that strike and went on to forge a 1-12 to 0-12 lead at the break. They didn’t let the initiative slip from their grasp in the second-half. Horgan showed the way as he struck some excellent points and Cork went 1-19 to 0-15 clear by the 53rd minute. Cork had several superb individual showings from Daniel Kearney at midfield and the defensive duo of Christopher Joyce and Lorcán McLoughlin. Conor Lehane hit a fine 0-4 haul up front while Alan Cadogan showed well also. For Clare, the second-half saw their form slump alarmingly. The scores dried up and they couldn’t breach the Cork goal as Anthony Nash denied goal attempts from Conor McGrath (twice) and John Conlon. Cork go forward to a Croke Park meeting with Dublin full of confidence while Clare’s need to arrest their losing run with a clash against Tipperary looming next. Scorers for Cork: Patrick Horgan 0-14 (0-8f, 0-1 ’65), Conor Lehane 0-4, Luke O’Farrell 1-1, Anthony Nash (0-1f), Daniel Kearney, Seamus Harnedy, Cormac Murphy, Alan Cadogan 0-1 each. Scorers for Clare: Colin Ryan 0-8 (0-6f), John Conlon 0-3, Bobby Duggan, Colm Galvin 0-2 each, Patrick O’Connor, Brendan Bugler 0-1 each. Email “Cork power past Clare in second-half to claim first hurling league win of 2015”. 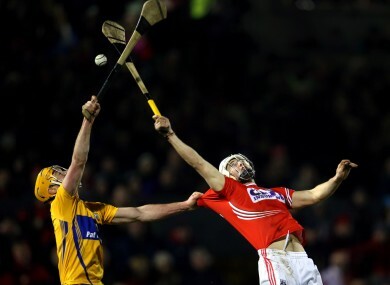 Feedback on “Cork power past Clare in second-half to claim first hurling league win of 2015”.